When Alan and I bought our Jayco Jay Flight 27BH travel trailer in 2006, we already had years of camping under our belts and knew what amazing adventures lay ahead. But camping was something new for our kids. Our son had tent camped with us when he was younger but he didn’t remember anything about the experience since he was only two years old at the time. Our daughter, listening to our camping stories from back in the day, was the one who kept insisting that she wanted to go camping too. Five years younger than her brother, she wasn’t around in our tent camping days and didn’t want to be left out of something that was obviously a big deal in our family and a lot of fun. 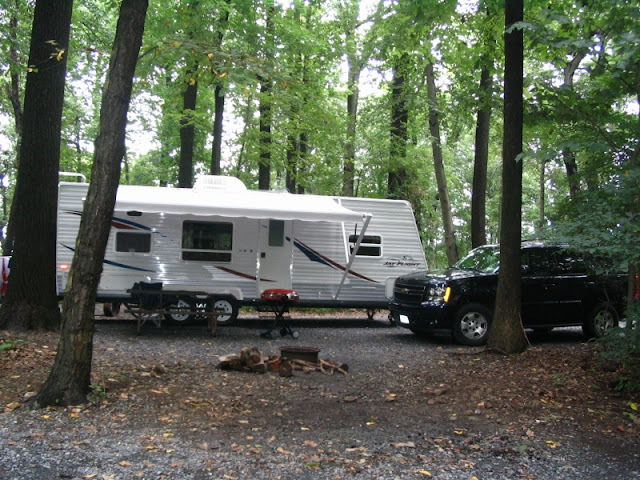 So, it was with much anticipation that we all awaited the arrival of our Jayco in the spring of 2006. We had planned a trip to the west coast of Florida that April to visit Alan’s brother and sister-in-law to be followed by a visit to Disneyworld. What we didn’t know was that Alan’s brother had ordered a motorhome at about the same time we ordered our travel trailer and that his rig would arrive before ours did, allowing us the opportunity to “camp” in his coach before ever laying eyes on ours. Sounds fabulous, doesn’t it? Well, it was, but it wasn’t. The coach was gorgeous, and Alan’s brother and sister-in-law had purchased a deeded lot at a motor coach resort near their home – a gated community, with a site right on a small lake. Just beautiful! Our gracious hosts allowed us full run of the coach and the kids, naturally, thought this was the best thing since sliced bread. Our dilemma? Explaining to the kids that this was not actually “camping.” Alan and I had visions of their young faces when they realized that our new travel trailer had no fancy kitchen, no dining room table and no extra-comfy leather sofas. And the RV parks we were planning to frequent would have no automatic privacy gates and less than spectacular landscaping. What’s a parent to do?! We did the only thing we could think of to break the news gently: After we arrived at the hotel that would be our home base for our Disney visit and settled in, we loaded the kids back in the car and set out to find a “real” campground. We found one in nearby Kissimmee, asked at the gate if we could drive through and were given the go ahead to explore. “This is the kind of campground that we’ll be staying in. And these are like the sites that we’ll have when we have our new travel trailer with us.” Were they disappointed? We couldn’t tell, but we did know that they loved their Aunt’s and Uncle’s coach. If this new reality was upsetting, they didn’t let on and, so, Alan and I hoped for the best. The “best” arrived about a month after we returned from our Florida trip when we picked up the travel trailer and drove home with a million camping plans and dreams in our heads. Unfortunately, that day was extremely windy and poor Alan battled side winds for much of the trip down the highway. Fortunately, he had been trailering boats and utility trailers for more than 20 years, so it was easy to tamp down my nervousness and we, of course, made it home safely. That first summer, we spent a week in Pennsylvania, visiting Philadelphia and the Lancaster area. It rained for 5 days straight and yet we all had a wonderful time. Except for that one Emergency Room visit. Sigh. Certainly, it might have been the excitement of our first road trip with our new travel trailer. But Alan and I realized that, for us to survive that much time with our outdoor activities restricted due to the weather, we had made the right choice with the one and only impulse purchase of our lives. We were off to a good start with the kids camping careers, one that would be solidified the following summer with our first cross country National Parks trip.